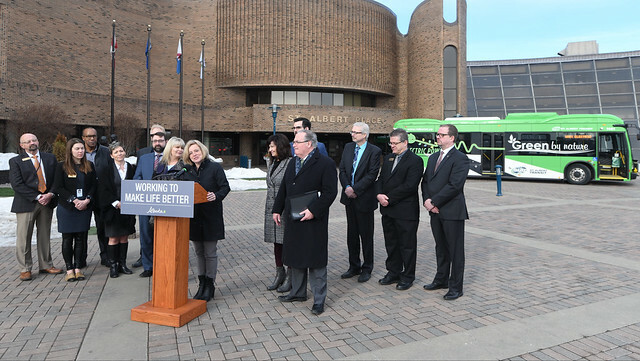 The Alberta government is investing in a new park-and-ride transit facility in St. Albert, making transit an even better option for commuters. Premier Notley and Minister Mason announce funding for a new transit facility in St. Albert. The planned facility at Campbell Road and Anthony Henday Drive will improve regional transit service, allowing commuters to leave their cars behind, saving them money on vehicle wear and tear, as well as fuel and parking. The $30-million facility is being fully funded by the province through GreenTRIP and the Municipal Sustainability Initiative. In its application for GreenTRIP funding, the City of St. Albert estimated that increased transit ridership would contribute to a reduction of 2,300 tonnes of greenhouse gas emissions per year. In Budget 2018, the Alberta government committed $1.5 billion over the next five years to help municipalities continue building accessible, affordable public transit. Construction is expected to begin in May 2018, with completion in 2019. Funding includes $20 million from GreenTRIP and $10 million from the Municipal Sustainability Initiative. The facility includes a transit transfer station and parking for 800 vehicles. It is the planned future terminus of the Edmonton Transit Metro LRT line.